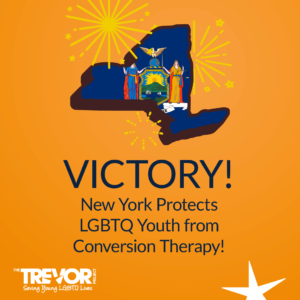 Albany, NY — New York today became the 15th state — and first state in this legislative session — to protect LGBTQ minors from receiving conversion therapy, the dangerous and ineffective practice that falsely claims to be able to change people’s sexual orientation and gender identity. Signed by Governor Andrew Cuomo this morning, the bills were introduced by Assemblymember Deborah Glick and Senator Brad Hoylman and quickly passed through the NY Assembly and NY Senate on January 15. Nearly 700,000 LGBTQ adults have been subjected to conversion therapy, with 350,000 of them receiving the dangerous and discredited treatment as youth. That number grows by thousands each year as the Williams Institute estimates that nearly 80,000 LGBTQ youth will be subjected to conversion therapy in the next few years. However, based on the five states that passed anti-conversion therapy legislation in 2018, the Williams Institute also estimates that 1,000 youth will be protected from the practice. The Trevor Project works with national partners such as the National Center for Lesbian Rights (NCLR) and the Human Rights Campaign (HRC) as well as state leaders like The Center to end conversion therapy. 34 states have historically introduced legislation to protect youth from conversion therapy; with NY today, 15 states have signed them into law. Conversion therapy is widely opposed by prominent professional health associations including the American Medical Association, the American Psychological Association, and the American Academy of Pediatrics.People can sign up to join The Trevor Project’s 50 Bills 50 States campaign, the nationwide effort to end conversion therapy by texting “TREVOR” to 40649.